Fast and cost effective delivery is important to us! 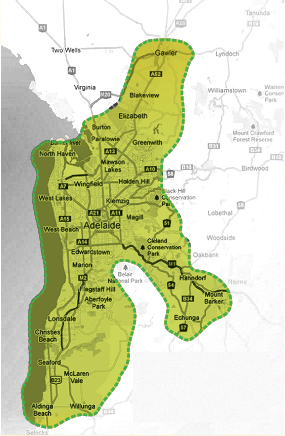 The green zone represents Pulpit Cellar's Adelaide Metro area. Some delivery methods may not be available to you. This depends on which delivery partner operates in your area. We offer pick up service, simply click 'click and collect' when you select your delivery address in the shopping cart. An email will be sent to you to let you know when your order is ready. Pick ups are from Pulpit Cellars, 24-26 Hutchinson Street, Mt Barker South Australia. Once your order has been processed and packed and we will send you an confirmation email to let you know the package has been shipped and also give you a coupon code. Firstly, enter your coupon, then click on the Submit button to search. Pulpit Cellars requires a signature and proof of age on delivery of all your purchase. Pulpit Cellar's supports the responsible service of alcohol. It is against the law to sell or supply alcohol to, or to obtain alcohol on behalf of, a person under the age of 18 years. You must be over 18 to place an order online or over the phone. If in the event that you aren't home when your purchase get delivered, the courier will leave a calling card for you to arrange a free re-delivery. You will then need to call 1300 36 1000 within 48 hours of the delivery to arrange a new time for re-delivery. If you can not be home for the re-delivery you can fill out the calling card which will either authorise the courier to leave your parcel unattended at the original specified delivery address or direct your parcel to the nearest post office. We ask that you promptly inspect products after they are delivered to you. Proof of purchase is required to get a replacement or refund. Pulpit Cellars will cover the delivery costs to return or exchange a product. Proof of damaged products and proof of purchase must be provided to obtain a refund. Please allow up to 5 business days for your refund or exchanges to be processed, after the initial Pulpit Cellars contact with you. *ONLY VALID TO ONE DELIVERY ADDRESS PER TRANSACTION, ADELAIDE METRO IS DETERMINED BY PULPITS DELIVERY ZONES. •Persons ordering alcoholic beverages must be over 18 years of age. •Alcoholic beverages must be signed for by a person over 18 at the time of delivery. •Any deliveries requiring redelivery, or redirection from an address provided to a new address, will incur an additional charge. •Stock is subjected to availability. •Prices, images and descriptions are subject to change. •All prices are in Australian Dollars and only available to purchase within Australia.